Bard's Leap Summit is a wooden plank at the very top of Lost Valley Redoubt. 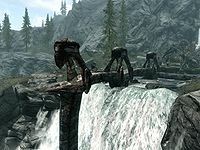 After fighting your way through a group of Forsworn to get to the top of the ruins, you will see a walkway extending over the edge of a waterfall. If you jump off the walkway into the pool below and survive, a ghost named Azzadal will appear. He will tell you that he attempted the jump as well, but he obviously failed to survive it. He will then play you a song that will increase your Speech skill by two points. After the initial jump, Azzadal will not appear again and the Speech bonus will not be granted. When casually jumping off, there might not be enough forwards momentum to land in the pool below and avoid the fall damage. Making the jump is possible without tricks but very good timing is required; one needs to hit the jump button at the last possible moment when running towards the ledge. Alternatively, the easiest way is to just sprint off the edge from a sufficient distant instead of jumping off. Surviving the leap is also possible by becoming ethereal before stepping off. The shout for this is learned at the nearby word wall. Another way is to charge off with Whirlwind Sprint. It is also possible to avoid death by making the jump while mounted. The death of the horse will not matter when using ArvakDG. If you fast travel here, your current horse, if any, will spawn off the side of the plank and fall. Sometimes when speaking with Azzadal you can hear him, but there is no sound when he plays his song. You will still receive the Speech bonus. This page was last modified on 11 January 2016, at 18:41.